Leading at the break by Ike Ugbo’s header we let the game slip in the second-half by not taking our chances and allowing a last minute winner. Adi Viveash will be hoping for better against Arsenal at the Bridge on Friday. The harrumphing in the Sky studio about this result was absurd. Apparently our defending was so woeful it deserved to be the sole topic of discussion. We remember years gone by when the side that finished seventh, visiting the reigning champions and recovering from a two-nil deficit to progress in the cup would have been an achievement. We did look like complete strangers at the back in the first-half, Gary Cahill in particular failed to anticipate or react but it was not just him. And Cahill did make amends by heading us back into the tie on the stroke of half-time. Caesar Azpilicueta then rocketed us level after the break and the champions looked second best. 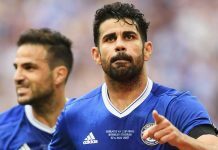 Diego Costa came on to torture their tiring legs and could have sealed the match before Cesc Fabregas stole in to hit two extra-time goals and sink what fight Leicester had left in them. The second period of extra-time dwindled to a death and we go into the hat for tomorrow’s draw. The league cup draw takes us on our first trip to the Olympic stadium in east London. The Hammers have not settled well in their publically subsidised new home so we will be looking to progress. Manchesters United and City will meet in the not, in no way, they couldn’t fixed for television draw. Tammy Abraham’s Bristol City entertain Hull. Very slow and poor before the break we at least perked up enough to grab an equaliser when Charlie Wakefield netted the rebound from Ike Ugbo’s shot but we conceded another late winner as Arsenal snatched the win with our defence looking for the offside flag. That makes three defeats in a row for the development squad. It will be interesting to see how they handle that. There were positives a healthy crowd has grown with regular academy games at the Bridge and Josimar Quintero looks an Eden Hazard in miniature. This was the worst performance by a Chelsea side in living memory. People keep praising how good Arsenal were but they weren’t – we were awful, we made them look good. If the first-half defending against Liverpool last week or Leicester in midweek was bad, then this was another level of incompetent. If we were not presenting chances on a plate we were ball watching, when we were not ball watching we were misplacing passes, dawdling, indecisive, inept. We didn’t manage a shot on target in the whole game. Antonio Conte said afterwards that hard work was the only cure but with a side so completely at sea and a full pre-season and eight games behind them it seems something more drastic might be needed. In the must win for the women we didn’t and lost our crown to City who have been better all season than everyone by a street. We posed them some problems in the fist half hour but after that their composure and finishing were the difference. It brings to an end a week we’d all rather forget.